Canton makes two such Reference Ventos, this £3,500 per pair Reference 5 DC based closely on the 809, and also a significantly larger and more costly £10,000 Vento Reference 1 DC, featuring two 300mm bass drivers, rather than the 2x200mm arrangement used here. It may well be that the larger model is better still, but past experience has shown that this is not always the case. There's a widespread tendency to assume that the largest and most costly loudspeaker in any manufacturer's range is necessarily the best. While that may well sometimes be true, it's also important to achieve a good match between bass output and room. In many cases the largest model in a range will only achieve this when used in a very large room, or one with walls, floor and ceiling that tend to absorb low frequency energy. Although the room used for our reviews is a good size by UK standards, measuring 4.3x2.6x5.5m, it's not as large as those typically found elsewhere in the world, such as the US. It also has more solid plaster-on-brick walls, rather than the energy absorbing plasterboard-on-stud construction. And since the 809's bass alignment had worked very well in our room, it seemed probable that the Reference 5 DC would, too. Which is not to say it's small. By any standards, this is a generously proportioned floorstander, standing 112cm tall and weighing a hefty 30kg. It's a full three-way design with four drivers on board. A pair of 200mm units, each with 130mm diameter metal 'dish' diaphragms and supplemented by a reflex port, handle the bass. A 180mm midrange driver, placed above the tweeter at the top of the enclosure, has a 115mm aluminium dish diaphragm. And the tweeter has a 25mm aluminium-manganese alloy dome under a moulded phase compensator. 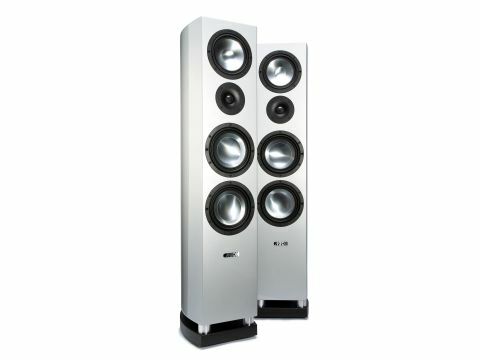 The Reference 5 DC might look very like an 809, but there are numerous subtle under-the-skin improvements. According to Canton, copper rings within the magnet poles of both midrange and bass drivers have substantially reduced asymmetric inductance distortions. The efficiency of the midrange driver has been improved, assisting the crossover transition to the tweeter and giving a better impulse response. The woofer voice coil has lower inductance and improved excursion linearity, reducing distortion and improving power handling and loudness capabilities. The tweeter has better distribution characteristics, and superior quality components are used throughout the crossover network. The enclosures of our samples were beautifully finished in a deep-lacquer-finish silver, which contrasts very effectively with the black frames and much shinier diaphragms, though traditionalists might prefer the maple or cherry real-wood veneer options. Curved sides taper towards the back, an arrangement that has several distinct benefits, adding considerable extra stiffness, helping avoid the focusing of internal standing waves and dispersing reflections. On the Reference 5 DC, these are manufactured by laminating together multiple layers of thin fibre board, giving a very superior combination of stiffness and damping. Grilles are supplied, and their mounting lugs are cleverly integrated into the driver frames. Furthermore, the drive units are properly flush-mounted, so this speaker looks very good if the grilles are left off. The whole thing is mounted on small shock absorbing feet that separate the enclosure proper from a chunky black MDF plinth. The simple stud-like spikes supplied are clearly intended to avoid damaging wooden floors, and are probably insufficiently sharp to pierce carpets. There's no lock-nut provision to facilitate height adjustment here either, but it should be easy enough to substitute regular 6mm spikes instead if desired. Perhaps Canton might consider including regular (sharp) spikes for those with fitted carpets. Twin terminal pairs are fitted, nice and close to the floor, so it will be easy enough to keep the cables tidy. Unfortunately, because of sample availability it wasn't possible to carry out a direct side-by-side (or sequential) subjective comparisons between the Vento R5 DC and the superficially very similar Vento 809. Close examination of the measurements, however, reveals some subtle but significant differences between the two models, so this is clearly a quite separate design. Indeed, the in-room measurements did indicate that the Reference 5 DC is not quite as smooth or flat as its junior 809 range-mate. But it's still an exceedingly well balanced design, with a studied neutrality and very little real character of its own. Entirely free from any warm, cuddly tendencies, it's not a design that immediately impresses at first listen - instead it's a rather cool customer that goes about its business in a matter-of-fact, understated sort of way. But after a short period of acclimatisation one starts to appreciate that this is actually a very good speaker indeed, but one that succeeds more through subtle understatement than any overt charms. One of its major strengths is that it manages to sound open through the voice band without any obvious aggressive tendencies: the sound is bright, for sure, but clean and clear with it. Even more impressive is the way the speaker maintains excellent linearity, fine clarity and superior communication skills even when operating at the sort of low levels that are necessary to avoid disturbing the rest of a household at 3am. The bass might have been better aligned for our room. Although the bass delivery is generally crisp, clean and very well damped, generating little if any thickening or overhang, the relatively high port tuning frequency of 48Hz does rather limit the genuinely deep bottom-octave bass on offer here, while the mid-bass output is correspondingly a little strong. The result is a touch lacking in the sort of scale that can make the ambience of choral music in a gothic cathedral sound totally spine-tingling, while the dead-weight atonal slap of a kick drum is a little less convincing than tuned tympani. The midband is where this speaker really shines, showing marvellous voice rendition, whether speech or song, solo or in harmony, and the believable way in which it rendered the subtle textures of instruments was a regular source of delight. An ancient recording from the very late and even more lamented Buddy Holly sounded eerily realistic, while it was fascinating to pick out the harmonising layers in a multi-tracked Simon and Garfunkel duet. Brass instruments are always tricky, either losing their rasp altogether or delivering it with too much 'edge', yet the Canton judges this beautifully, with an open realism that is thoroughly convincing. Orchestral strings also have a tendency to 'clump together' into a homogenous mass, yet here it was easy enough to gain some idea of the size of the orchestra that was playing, and take note of the texture of the instruments themselves. Some of this speaker's subtle midband discrimination might have been attributed to the improved CD sound brought about by upgrading the Naim CDS3's power supply from XPS2 to 555ps (as reviewed on p48). But the observation wasn't limited to CD sources alone. Much the same was true when vinyl was being used, and when the Magnum Dynalab MD102 FM tuner was doing its thing. Imaging is precise and well focused, giving a nice impression of height, though depth perception did seem a little constrained. In addition, the very low cabinet coloration right across the band ensures superior dynamic range, but mild time-smear slightly reduces the impact of dynamics.